Barriers which hinder career advancement of women are complex and varied. They have become top agenda items for most corporations and the gov-ernment. The "glass ceiling" is a term that symbolizes a variety of barriers that prevent qualified individuals from advancing higher in their organization. Although many women hold management positions, few have made the breakthrough to top-level positions. To determine what conditions are required for women to attain top executive positions, an ethnographic study was conducted at a hospital. The study was limited to four women who held executive positions: one associate administrator, one interim associate administrator, one director and the CEO. An in-depth data gathering technique using observation, interviews and documentation was used to investigate factors such as education/skills, influences, support, barriers and corporate culture. The findings revealed: (a) having opportunities to be participating, valued family members and to compete in activities while young helps girls to develop a sense of competence and mastery; (b) education, credential building experiences, certain competencies and being willing to take risks are necessary for success; (c) having certain attitudes and philosophies are crucial factors in their success; (d) mentors, network involvement and relationships with peers does affect mobility; (e) the women did have a career plan, not in the sense of a linear career plan, but rather one in the form of the spiral career concept; (f) the hospital is a structure which provides opportunities to develop careers; (g) the women understand, accept and have learned to adapt to the culture of the society in which they live and work; (h) the women are savvy at expressing, affirming and communicating the substance of their culture to others; (i) the amount of prejudice a woman encountered depended upon several components; and (j) the barriers to advancement experienced by the women do not confirm those discussed in the review of literature. 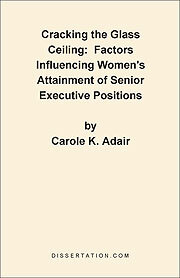 Further research is recommended on the qualifications of male and female CEOs, educational programs most appropriate for female executives, how successful female executives learned to deal with their barriers and why certain organizations do not have top female executives.